The Curvy Collection is for the women sized 14-28. Meet your new favorite t-shirt! The softest, smoothest t-shirt you've ever felt is now available in a ladies Curvy Fit - making it perfect for lounging around the house or wearing out on the town. These shirts are softly shaped to complement a plus sized woman's curves. 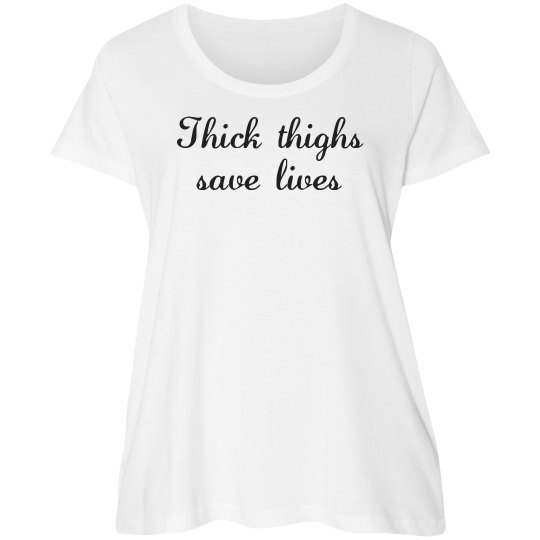 This curvy Plus Size tee features big, bold, black, scripty text that says "Thick thighs save lives". We call this font Lauren Script. It's slightly italicized and great for spreading your message to the world. Especially if that message is one of Body Positivity. It's wild to us that it's so hard to find quality Plus Size t-shirts out there. We're trying to fix that, one funny tee at a time.